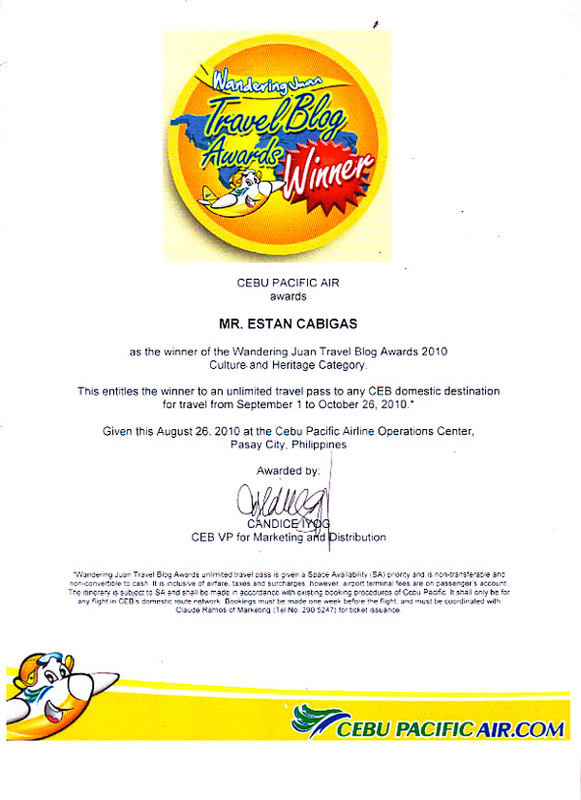 In Cebu Pacific’s latest contest, the Wandering Juan Travel Blog Awards, Langyaw.com wins in the Culture and Heritage category earning a two month (September and October) free pass in the budget airline within their domestic destinations plus a 3 days/2 nights stay for two at Marco Polo Hotel in Cebu. The awards had three categories that also included adventure/sports and leisure with best travel blog photography and best green travel blog. In the category that I won, I submitted my piece on my home province’s watchtowers: Cebu’s lonely sentinels of the sea which was part of my Cebu/Sugbo series. The travel blog winners, L to R: yours truly, Blanca, Marcos and Angel. Ada did not make it. Am I happy? Of course! Despite the fiasco I experienced with the airline a few months ago, that was already history. And besides, with the free tickets, I need not worry of bungled online ticket booking payments, again. No headaches and no sleepless nights. The winners? Marcos of ambot-ah won for Leisure and Relaxation. Angel of Lakwatsero won the Adventure and Sports category. Ada, Adaphobic, the Best Travel Blog Photography while Blanca, Random Thoughts by Blanca, the Best Travel with a Cause blog. Congrats to you all! A big applause to you Estan! One big honor after the other. You deserve it. …another feather in your cap.. balato naman! Congrats, Estan! Im not surprised! Been an avid fan fo a very long time! Cheers! @blanca, yes! congrats to us!